Controversy Precedes Pope On Trip To Middle East Pope Benedict XVI begins his first tour of the Holy Land this week, with stops in Jordan, Israel and the Palestinian territories. The Vatican says the pontiff will bring a message of peace to the troubled region, but his visit is still stirring controversy among Israelis and Palestinians. 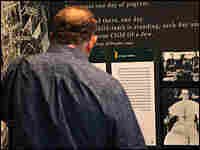 A tourist looks at a display at the Yad Vashem Holocaust Memorial Museum in Jerusalem that alleges Pope Pius XII, leader of the Roman Catholic Church during World War II, did nothing to stop the extermination of the Jews. Pope Benedict is scheduled to visit the grounds of Yad Vashem but not visit the museum in protest. 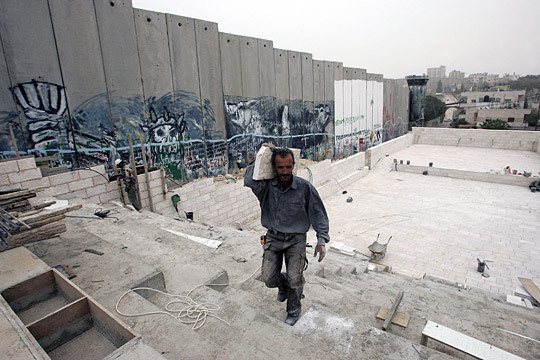 A Palestinian man works at the construction site of a stage next to Israel's controversial separation barrier bordering the Aida refugee camp near Bethlehem. Residents had hoped the pope would deliver a speech from the stage; now, officials say he will speak at a nearby school. Pope Benedict XVI begins his first tour of the Holy Land this week, with stops in Jordan, Israel and the Palestinian territories. It's only the second official papal visit to the Jewish state and the occupied territories, coming nine years after a groundbreaking trip there by Pope John Paul II. The Vatican says that Pope Benedict will bring a message of peace to the troubled region, but his visit is still stirring controversy among both Israelis and Palestinians. One place Pope Benedict will visit is Yad Vashem, Israel's official memorial to the Holocaust, where he will deliver a speech. Many Israelis say that what he says will be pivotal to how he is perceived in the country. The pontiff — a German who was briefly a member of the Nazi youth movement — most recently raised the ire of Jews when he rescinded the excommunication of a Holocaust-denying Catholic priest. Avner Shalev, who heads Yad Vashem, says many Israelis want to hear the pope firmly acknowledge what happened to the Jewish people. "He should be more sensitive. He should be more careful about how he relates to the events of the Holocaust," Shalev says. "To me, his position is not clear enough — and to many, many others. So it gives him a great opportunity to clarify it for his believers, his followers and many, many other human beings." But whatever the pope says, the church and the directors of the Holocaust memorial site will still be at odds. 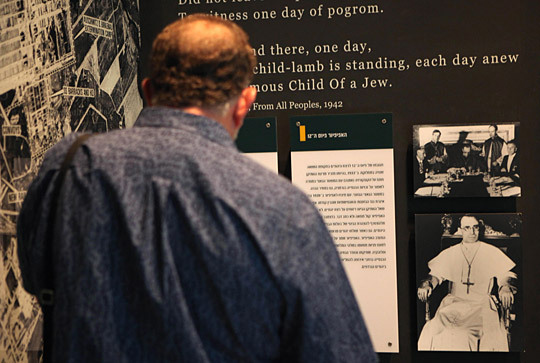 The pope's speech will be made on the grounds of Yad Vashem, but he will not visit the adjoining museum — in protest of an exhibit that alleges that then-Pope Pius XII did nothing to stop the extermination of the Jews. Pope Benedict has vigorously defended his predecessor's wartime record and supports his canonization. Another stop on the papal itinerary is Bethlehem, which has a sizable, but dwindling, Christian community. The barrier that Israel is building in and around the West Bank has made life more difficult for Bethlehem's residents. The Rev. Marwan Didas, a Palestinian priest who lives in Bethlehem, says every year, more Christian families are leaving the area looking for opportunities elsewhere. He says he hopes the pope's visit will give Christians an appreciation of their own land and a reason to stay. After addressing his Christian flock, the pope will visit the mostly Muslim residents of Aida, a nearby refugee camp. There, next to the partition that divides the Palestinian territories and Israel, camp residents are building an amphitheater, which the Israelis have threatened to demolish. Jumah al-Owais is helping to build the theater. He says the idea was to have the huge concrete slabs of the wall serve as a backdrop for a speech the pope was scheduled to deliver. "When the pope comes, the eyes of the world will follow him, and so all the world will see the suffering of the Palestinian people," Owais says. But Mustafa Jamil, of the refugee camp's council, says that the stage has become too controversial and the pope will instead make his address from a nearby school. Jamil says he is bitterly disappointed that the Vatican caved to what he terms "Israeli pressure." "We were very excited about the visit of the pope. We prepared this place to receive him, then we were shocked to find out that the pope will not be delivering his speech in the place we had prepared but somewhere else," Jamil says. Although the stage won't be used for the papal visit now, the Palestinians are still busy building it — and the Israelis continue to threaten to demolish it.